Hey and happy Monday to you. I hope you had a great weekend. We were busy here trying to play catch up after taking last weekend off, and we were able to get several projects done. 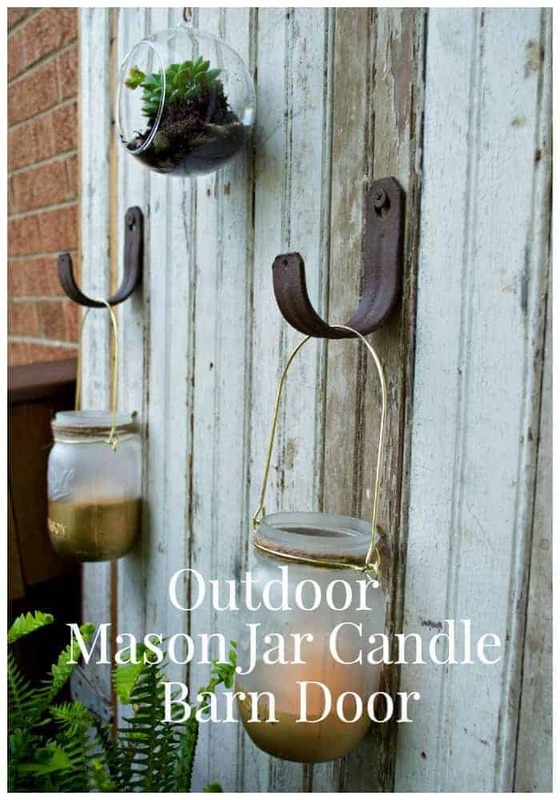 One of the projects that I’ve been working on the last few weeks is an outdoor mason jar candle barn door. Wow that’s a mouth full, but I’m really excited about how great this turned out. 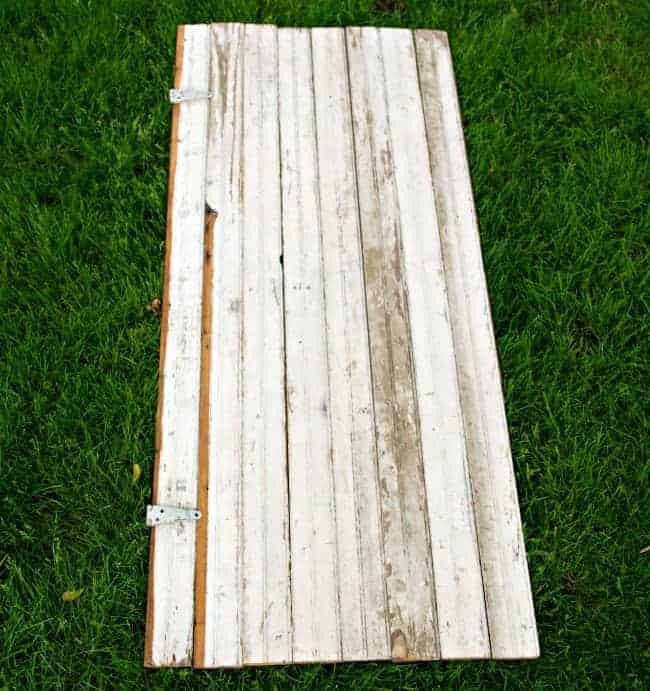 Several weeks ago I went to the Kane County Flea Market and left with an old, chippy paint barn door for an outdoor project I had in mind. We have a small(ish) deck that has limited decorating space. 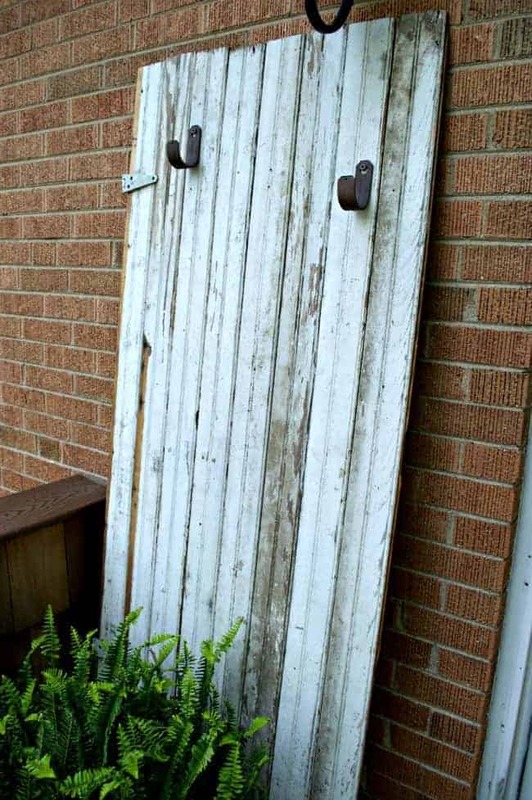 I’ve wanted to hang things on the house to decorate a bit since we moved in but the walls are brick and the hubs won’t let me drill into them, so this old door will be the perfect hanging spot. 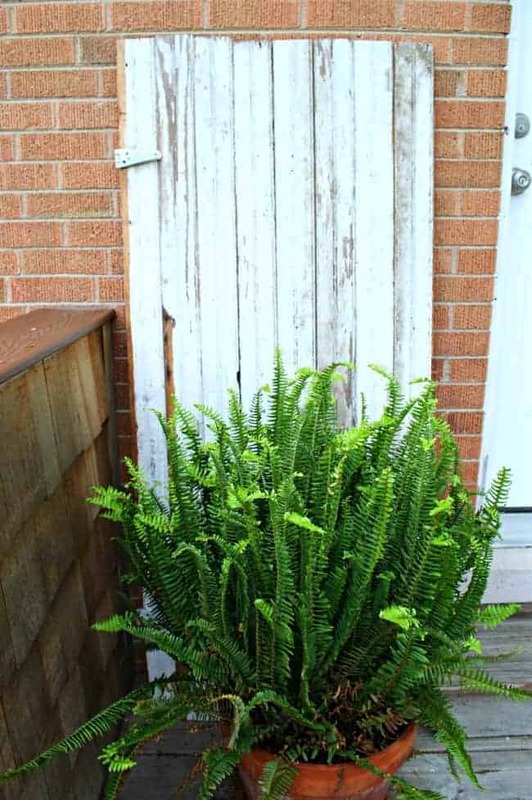 I would have liked to have found an inexpensive tall door but that didn’t happen so I added some height with copper rods the hubs got from work. I just drilled 2 holes in each pole and screwed them to the door. Now it was time to figure out what to put on my tall beauty. 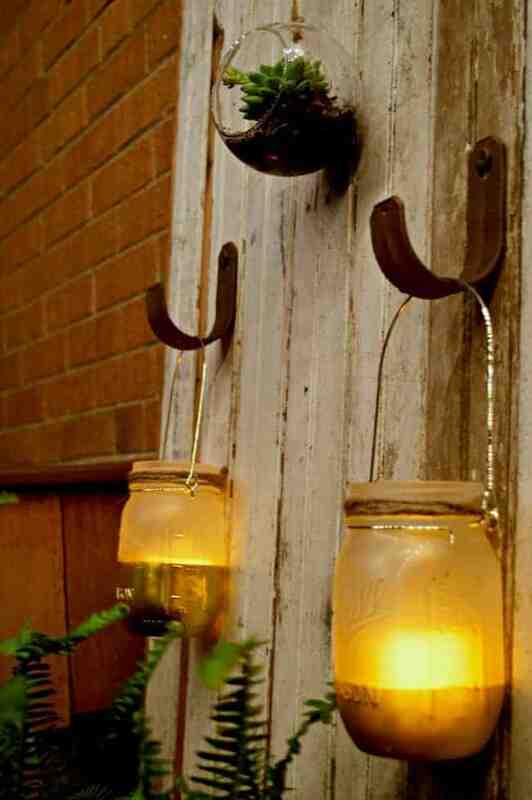 My first thought was to hang candles using some kind of jar. I’ve seen all of the hanging candle jars in the stores but I wanted to try to do something different and make my own so I picked up two different sizes of mason jars, gold metallic spray paint and frosted glass spray paint. I just taped off the jar so only a portion of the bottom was exposed, then I sprayed them with the gold metallic paint. The lesson I learned here was that I needed to carefully remove the tape right away so the gold paint wasn’t pulled off the glass and I had a crisp line. 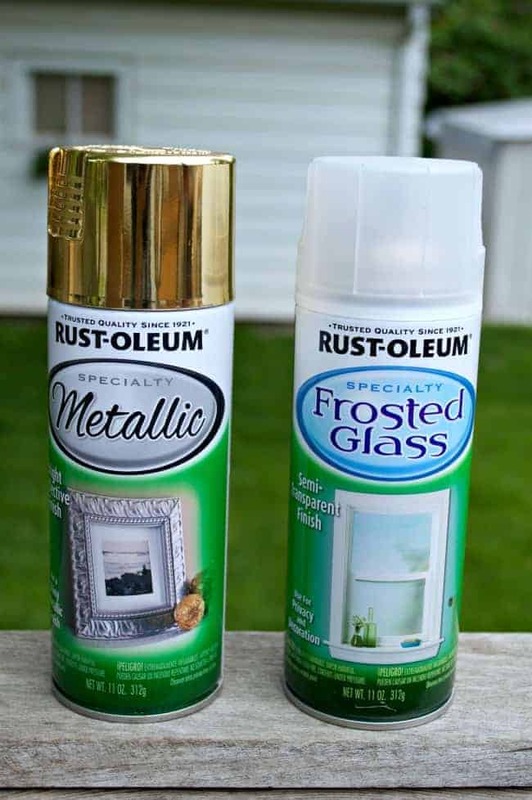 Once the gold was dry, I sprayed the whole jar with the frosted glass paint. I originally bought wire to make my own hangers but I saw ready-made ones in gold in the store so it was easier just to use them. A little jute twine was added and my jars were done. The hooks to hang the jars was a bit harder to find. 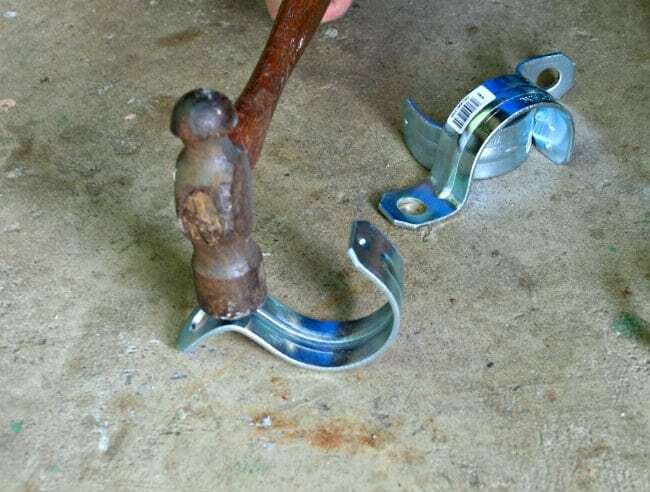 I didn’t want a regular small hook so I searched Home Depot for something to make myself. I hit the jackpot with some 2″ rigid straps for $1.04 each. I just hammered the end with the hole so I could hang it flat on the door…instant hooks. 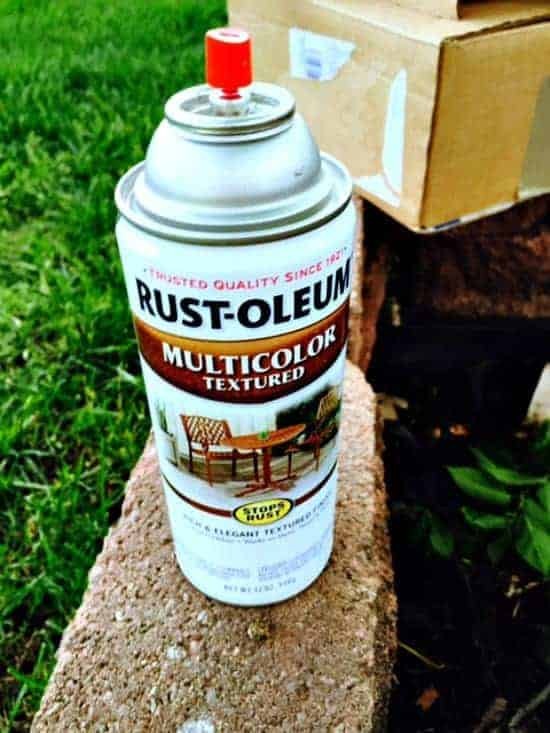 To give them a rusty, rustic look I used a multicolored textured spray paint (after I primed them of course). With everything painted, dried and put together, I screwed the homemade hooks on and put together my outdoor mason jar candle barn door. 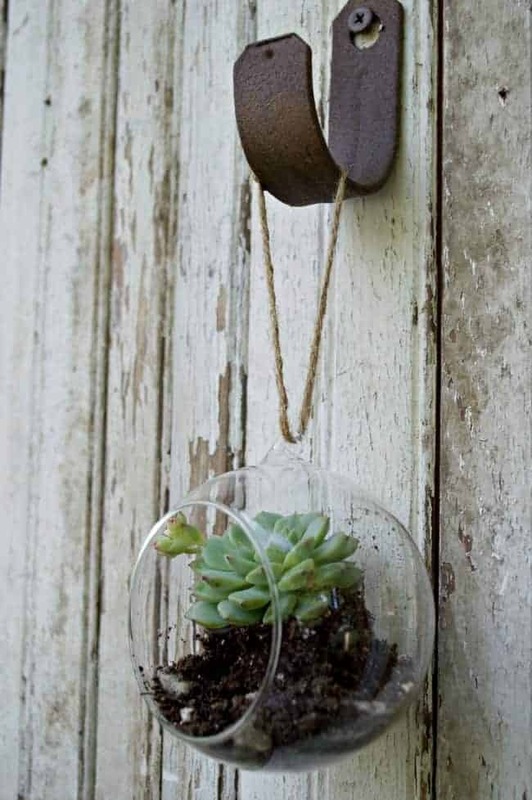 So while I was putting this all together I had an idea to hang a little something different on the door, to be specific I wanted to use a cactus in a glass ball. I thought it was a good idea and I figured that I wouldn’t have any trouble finding what I needed. The problem is that once I get an idea it’s hard to let go, so I ended up driving to 4 different stores looking for a glass ball until I finally found one, hiding on a shelf behind some fake plants. I’m not sure how well the cactus will do in there and I’ll have to change the twine to something sturdier but I think it’s cute. 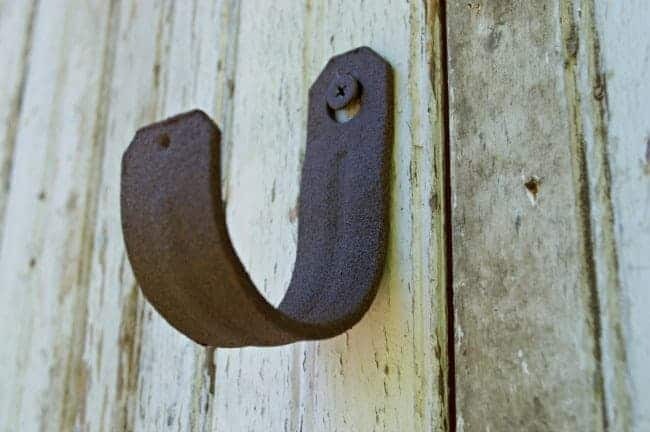 And what about the hooks, don’t they look rusty and rustic? Ok enough with the how-to, let’s look at it all put together. Instead of using real tealight candles, I chose battery operated outdoor candles. They flicker so with the frosted glass they look like real candles. 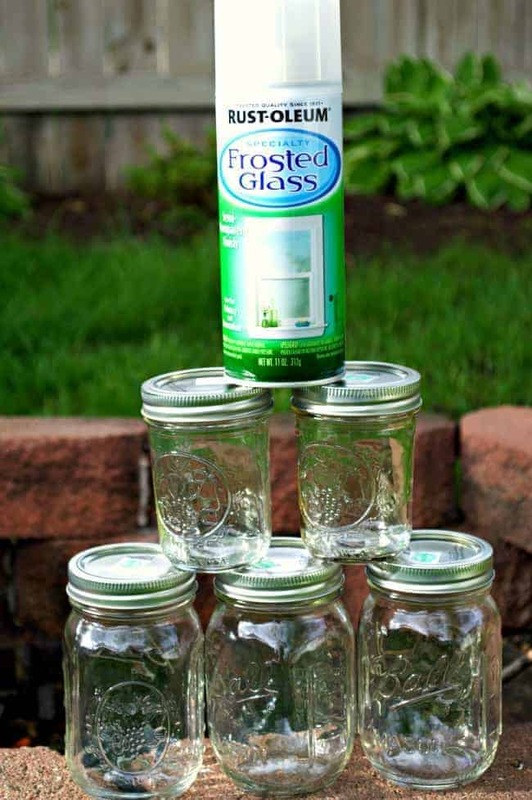 It seems like mason jars are everywhere these days. Do you like to use them? In order to keep the rustic look on your round bowl. Why not put on a wire then wrap it in the twine. You could do the same on the others also. 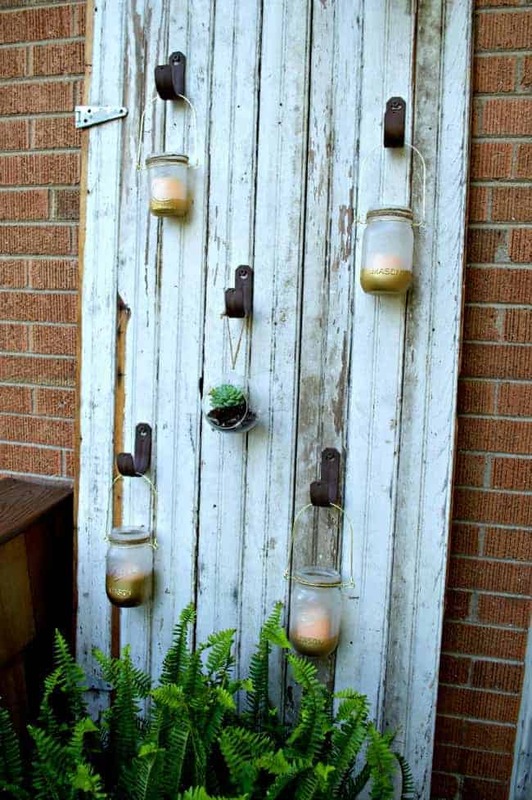 I love your idea and have wanted to do something with an old door. It has inspired me. I thought of that Wanda but, with the jars sitting outside, I wasn’t sure how the twine would weather. Great idea though, thanks for sharing and I’m so glad my project inspired you. 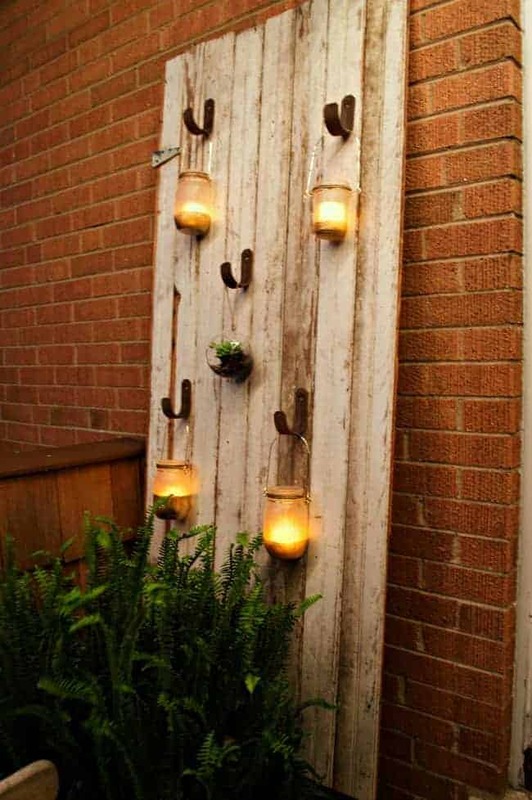 I love this idea and it looks so pretty at night! Love it!! thanks for the great pics. Caught you on Hometalk and had to check you out. Awww, thanks so much for the nice comment Jerri. So glad you stopped over from Hometalk. This is super cute! 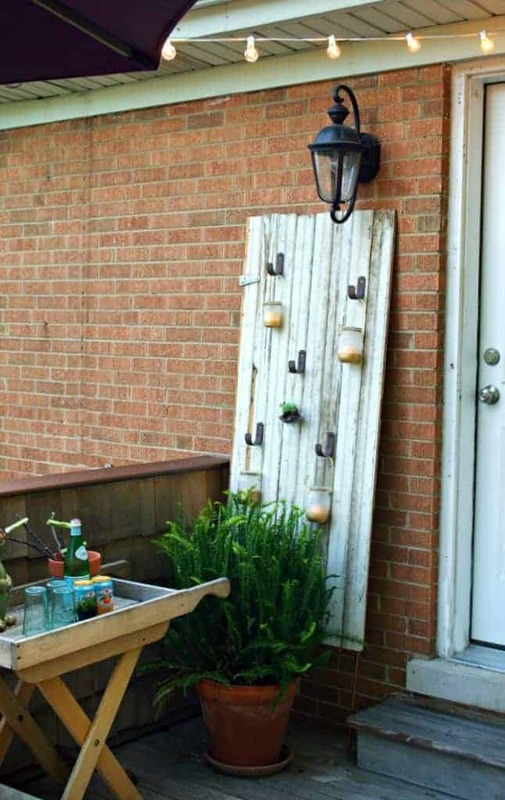 I love the outdoor planter DIY idea. Love it! 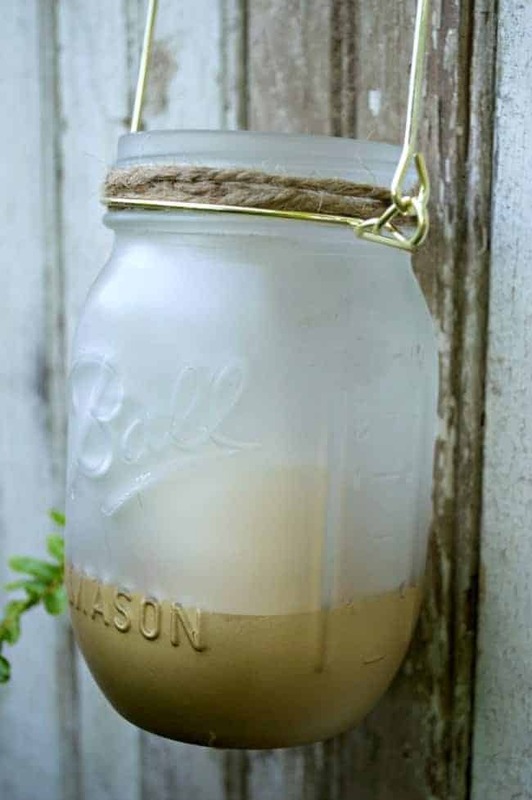 I love when you can combine mason jars and repurposed wood. Perfect! Thanks for sharing this creative idea! Thank you Pam! I appreciate you stopping in for a visit. This is simply awesome Kristi!!!!!! 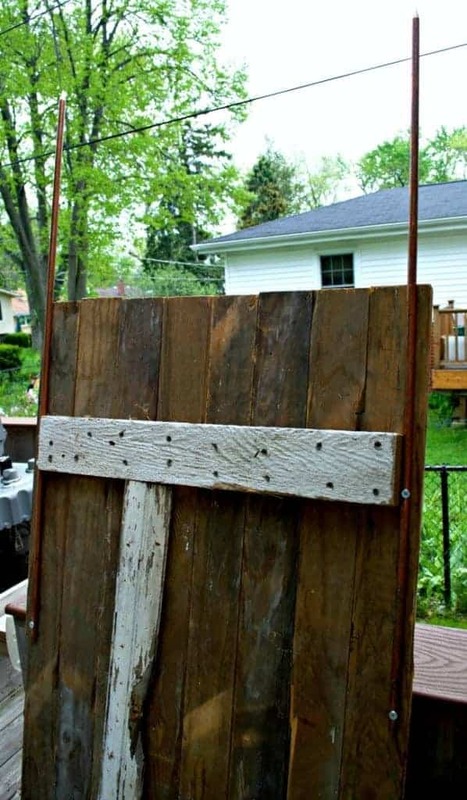 I would have passed on that barn door but wow, you saw it’s potential in a good way! Love it! Wow…I love this project! 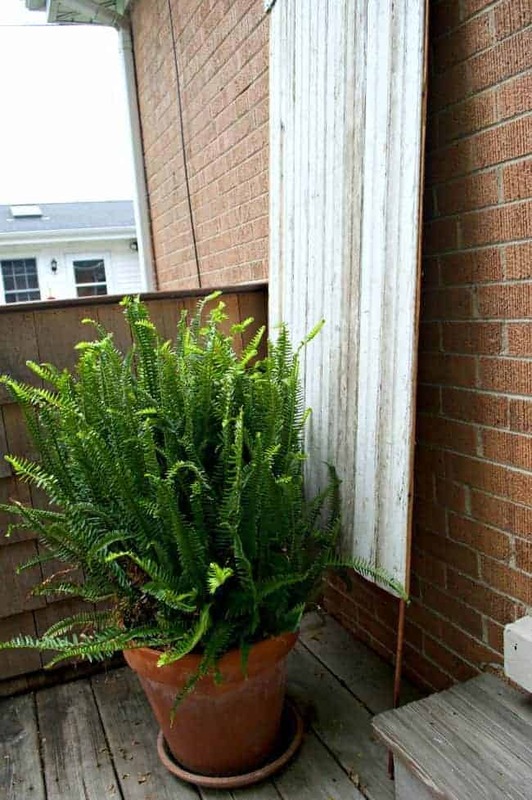 !…and great idea to elevate the door…for height and for keeping the bottom portion of the door dry…You did a fantastic job! Thanks Shirley! It was a fun project to figure out and do and I love looking at the candles flickering at night. Hope you are having a great week. I love it Kristi! What a good idea! 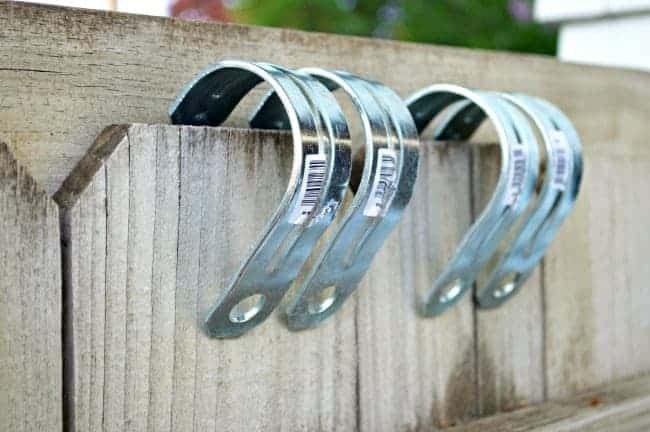 My hubby would not let me put nails or screws in our siding either. Thanks MJ! I love it too. I remember the Sweet Woodruff pics from last year, I bet they are beautiful. Enjoy! Awww, thanks so much Christine. I’m loving how it turned out. Love your door. You are so creative. I use Mason Jars for storing things in the kitchen. I am not much of a plastic person. I see a lot of them used in decorating these days but have not used them myself for decorating. Bet it looks nice at night and is very cozy to sit with hubby. Thanks Debbie. It looks pretty at night with the flickering candlelight. I’ve been using mason jars more and more lately too (not a fan of plastic). Hope you have a great week. Thanks for the kind words Kim. Much appreciated!